Friday, May 5, 2006 11:00 a.m. to 11:30 a.m.
Los Angeles and Tehran based artist Marjan Vayghan discusses politics of transnationalism in her work featured at the Museum of Martyrs in Iran during the summer of 2005, as well as current projects including but not limited to the Building Bridges Show. Which is an exhibition curated between Iranian and American artists over seas. This show is curated with aspirations of raising awareness promoting unity and collaboration between both the west and the east (other wise known to one another as Axis of Evil and the Great Satan). As an Azeri-Iranian American, my life has been and continues to be informed by transnationalism, which engages the subject as a flexible citizen. Notions of home become an idea which manifests throughout my work. The impetus of my creative practice is an effort to bridge diverse communities and create a space of creativity and understanding. I’m interested in notions of borders and classifications that give me a sense of “Home” in Iran and the States, while simultaneously creating sensations of displacement and alienation, a condition of hybridity. My work becomes is a site where I reconcile this condition of dislocation, and create an alternative space that engenders community and belonging for those existing in between cultures, nations, and homelands. 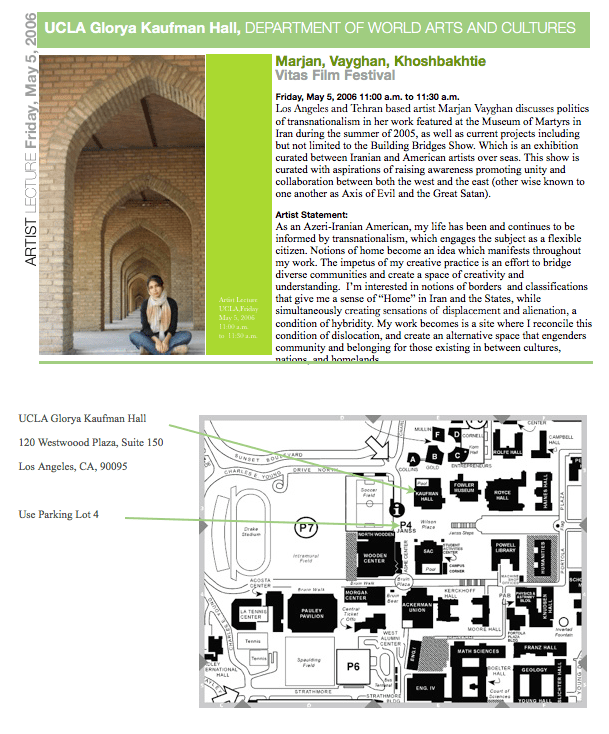 The 2006 Vitas Film Festival, Choreographing the Margins, evolved as students thought about the process of artmaking from political, social, and personal perspectives. UCLA and Otis College of Art and Design students explored the power of art to reshape ideas about populations, issues and events influencing our lives. Their perspectives and those of professional artists and film scholars create a dynamic festival that includes lecture, performance, art exhibition, and screenings dealing with local, national and international issues—from racism on the UCLA campus to suicide, domestic work and genocide in Sudan. Welcome to our blog. This is the place to find internship information, job opportunities, announcements and general happenings around town. If you’re an alumnus who has been away for a while, stop in and visit our new (physical) location. If you’re a current student, this is the place to hang out with your PAS buddies without ever having to leave your sofa. If you’re an incoming student looking to meet fellow students before the fall academic term you’re in the right place. Welcome. 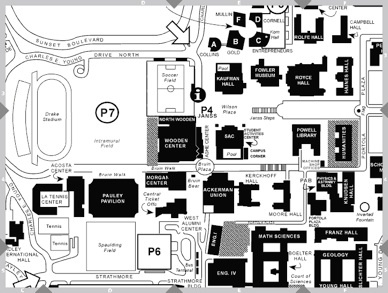 The 2006 VITAS Film Festival, “Choreographing the Margins” evolved as students began thinking about the process of art making from political, social, and personal perspectives. UCLA and Otis College of Art and Design students explored the power of art to reshape ideas about populations, issues and events influencing our lives. 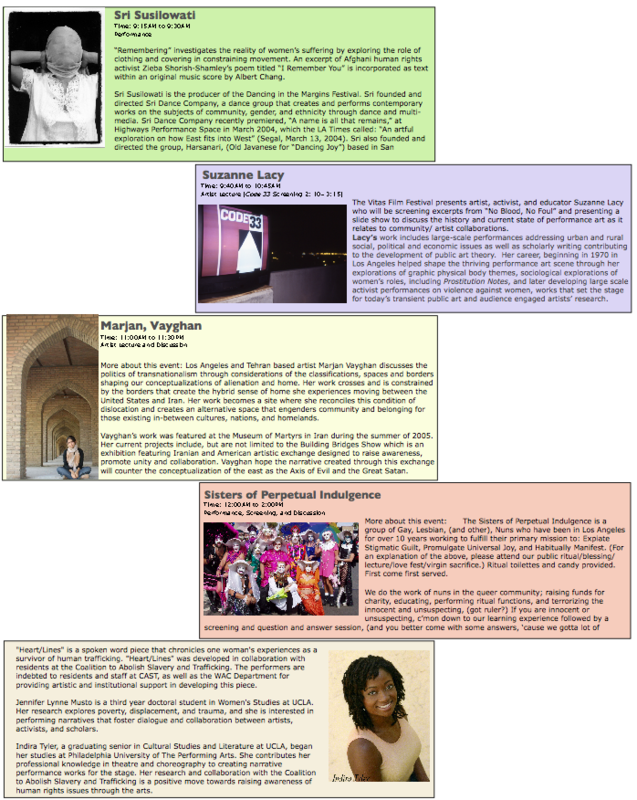 Their perspectives and those of professional visual and performance artists and film scholars create a dynamic experience that includes lecture, performance, art exhibition, and numerous screenings dealing with local, national and international issues, from racism on the UCLA campus, to suicide, domestic work and genocide in Sudan. The day long schedule consists of four distinct sections.